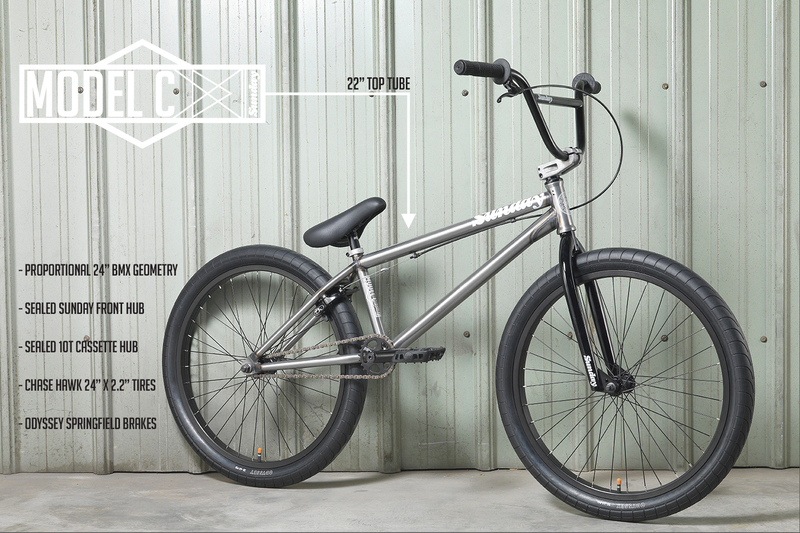 Sunday Bikes just dropped a preview of their 2016 Bikes. The 24″ Model C is still in the lineup and it looks like they have souped it up a little for the new model year. The first thing that catches your eye is the frame…a rawed out, clear coat version of their flagship 24″ complete. Also notable on this complete? The much buzzed about 24″ Chase Hawk tires. Yes, my friends they come standard on the 2016 Model C! According to Sunday, “updated and detailed bike pages [will be] up soon”…so watch for details on the complete spec breakdown in the next week or so. Sunday dealers will also have the new lineup in stores in the next couple weeks so keep your eyes peeled. This thing looks freakin awesome. Got the tires, man they are fast and sticky. Rode dirt with them a few days ago and surprisingly no traction problems at all.